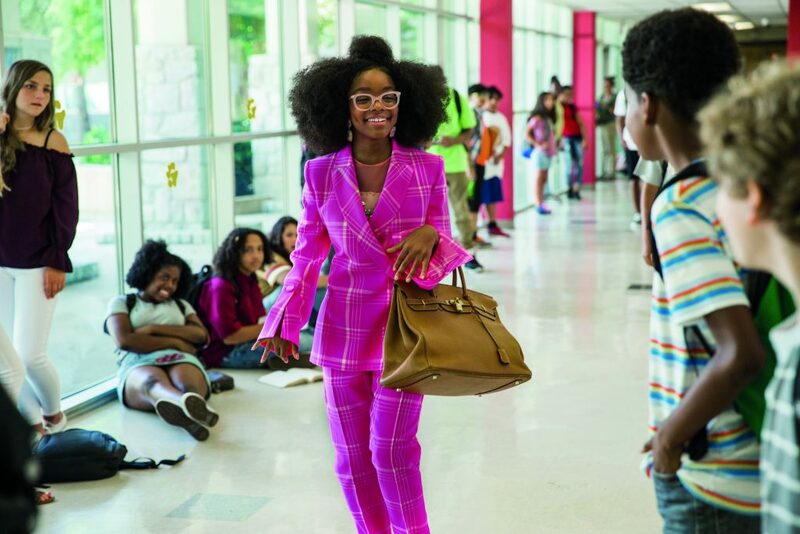 In most of Little, 14-year-old Marsai Martin exudes the energy of that manager you absolutely hate. While her small face is framed by a huge halo of tight coils, her attitude is one of a high-power CEO that has been hardened by life. The gag is that she’s actually supposed to be an adult woman (Jordan Sanders, played by Regina Hall). Having launched into a tirade toward a teen magician she calls “black girl tragic”, she’s been reduced to her pubescent form and has to get to grips with being wise beyond her years but limited by her physical age. It’s a fitting narrative for on-the-rise Marsai who, despite actually being little, has taken her first foray into executive producing via a film set for a worldwide cinematic release. She’s the youngest ever to do so. Yet, she doesn’t seem at all out of place in the junket setting. In a cluttered room at the London West Hollywood hotel under hot fluorescent lights, she sits cross-legged – politely and eloquently answering rounds of repetitive question from journalists all over the world with as much enthusiasm and spontaneity as the first time she was probably asked. She first made a name for herself on the hit sitcom Black-ish alongside Tracee Ellis Ross as the smart and mature twin Diane. During our interaction, I almost want to ask for her birth certificate to prove that she isn’t just a small adult scamming the industry; and there are other times where she’s almost fearsome – notably when her brows furrow when I pronounce her name as “Mars-eye” rather than “Mar-say”. Marsai Martin as little Jordan Sanders in Little, co-written and directed by Tina Gordon. Most of Marsai’s on-screen moments are alongside 34-year-old Insecure creator, Issa Rae as April, her punchbag employee who ends up having to help her out of her body swap nightmare. The bond between them is palpable on and off screen as their bickering and joking mirrors the sort of relationship a teen might have with her older sister. “We were laughing a lot [on set],” Issa says. Most of the jokes seemed to be aimed at Luke James’ thirst trap character Trevor. Playing Jordan’s needy boyfriend, his hammy acting (and let’s be honest – his banging body) brings some moments of levity. “There are so many lines that we got to improvise. We just had so much fun with the dynamic, especially as we became closer. Tina Gordon who directed it fosters the most fun and creative environment,” Issa adds. In the film, Jordan is forced to reckon with the memories of being targeted as a nerdy science enthusiast at school and sees her weird circumstances as a way to empower some misfits who are currently social pariahs at their school. For a lot of people, revisiting their teen years would be extremely painful. “All of my teens I would rather not have to relive!” reveals Issa. She’s spoken before about how she grew up feeling too black for private schools and too white for public schools. “If you wanted to put a curse on me then take me back to my teen years because it was not a great time. You’re trying to figure things out, you’re restricted. Everything feels so much more dramatic than it really is,” she says. “I guess if I did go back I’d have to remember that it’s not that serious. Time is not about to end.” Weirdly Marsai nods and hums in agreement, when the most tumultuous teen years are surely yet to come. Truth be told, at times the execution of the film is as clumsy as adolescence itself. It’s a slow burner, taking you a little while to get over the protagonist’s personality. At times she’s less megalomaniac and more demonically possessed. There’s also an off-colour trans “joke” at the start of the film that feels quite jarring and feels like a punch downwards. Still, this fits into the allegory. Jordan was bullied as a teenager, so after her glo-up to tech entrepreneur, she’s determined to make people around her feel small. Overall, what is impressive about the project is Marsai’s presence both as the protagonist and also behind-the-scenes. Both Regina and Issa testify that they would have loved to see someone like Marsai when they were growing up. And the teen filmmaker was motivated by the same dearth of representation. “Not seeing myself on the big screen motivated me to push for this film,” she explains. Little is out in cinemas worldwide today.